Haven’t played since college? Now that you’ve got kids, we’d like to encourage you to dust that old guitar off and start playing for your son or daughter. In this 60-minute class, you’ll learn basic guitar technique and selected songs from the current song collection so that you can make even MORE beautiful music at home. 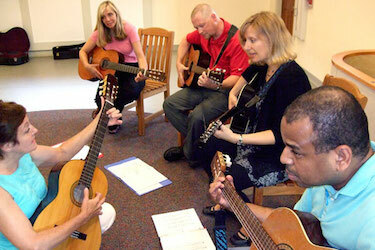 Piloted around the country in 2010, the guitar class is quickly becoming a hit among adults who are looking to improve - or pick up a guitar for the very first time! Participants will learn basic strums and chords for more than a dozen songs from the current Music Together® song collection. This class is good for beginners who have never held a guitar—and good for people who know a little guitar, and great for people who already play some Music Together songs! All participants build technique and musicianship in an organic, relaxed way while learning new ways to explore Music Together songs with their child at home and on the road. Plus, it’s an enjoyable night out with other parents of small children. Can anyone take this class? Your child must be currently registered with the program (any class - babies, mixed-ages, threes and fours, or Rhythm Kids) in order for you to be eligible to attend Music Together Guitar for Adults. We use the current song collection, so you can learn to play songs that your child is hearing and experiencing regularly in class and at home. I've never played an instrument before. Is it too late? We believe it's never too late to learn something new! Our guitar curriculum has been designed with the beginner in mind, and we'll work with you so your experience is a fun one! Class will be limited to eight students so individual attention can be given to all. To get you started, here is a video demonstrating how to tune your guitar and play the "Hello Song" with simplified chords. Guitar Tuning Video.